QUESTION: I been having problems all summer with some of my crape myrtle losing its leaves. It looks like fall, the plants are half bare. 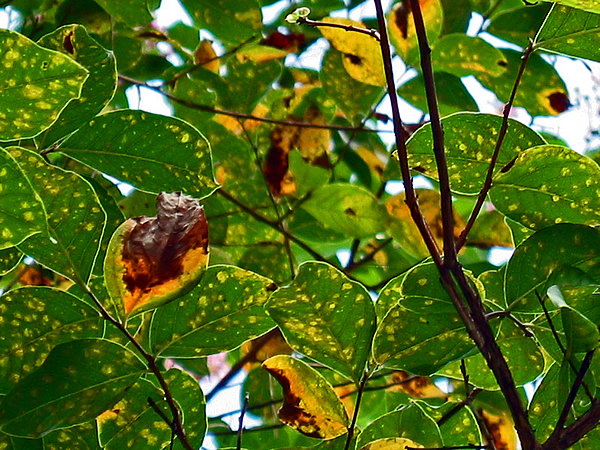 The leaves turn yellow, then dark and fall off. In addition, they have not been flowering very much. I don't see any indication of a fungus. Attached is a picture if that would help. About half of my crape myrtles are having this problem. I live in the Woodlands, outside of Houston. The problem started early in the summer during all the rain. While the ground has been wet, it has not been holding water. ANSWER: This looks like Cercospora leaf spot to me. It is favored by humid climate, frequent leaf wetness from rains, and poor drying conditions (crowding, dense canopies, etc. ), which occurred in much of TX in the summer of 2007. 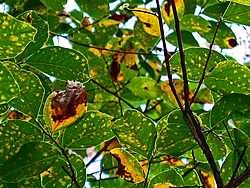 This disease causes yellow spots that eventually turn necrotic and then defoliation is severe. The fungus is often visible only with magnification (clusters of black conidiophores on the leaf surface producing white to gray spores that may be quite obvious after periods of high humidity. ).